McDonald’s embraced Christmas almost as much as they embraced Halloween—with toys, special menu items, and festive commercials, McDonald’s helped to get us excited about the holidays. Here’s six ways that McDonald’s was all up on Christmas. Fact: these will make your dreams come true. First of all, Muppet Babies are freaking fantastic. It’s really unfortunate that it’s not out on DVD—in fact this is one of my biggest nostalgia gripes. Can we just settle musical differences for the greater good? Second, in order to obtain awesome plush Muppet Babies, you got to eat a Happy Meal. Maybe that’s not appealing to you, but when you’re five years old, a McDonald’s Cheeseburger Happy Meal is some real gourmet food. McDonald’s really outdid themselves with these toys—not your standard tiny plastic knick-knacks—these 1988 plushies were pretty big for a Happy Meal toy, big enough to cuddle with. The idea was revamped in 1994 for Mexican McDonald’s which replaced Miss Piggie with Gonzo. I’m not sure how I feel about it, but hey… Gonzo! After the 1988 release of the Muppet Babies plushies, McDonald’s had to do something to retain their cool Christmas factor. Enter this set of Garfield plushies. Released in 1990, this set featured two Garfields and an Odie. I think they could have gone with Nermal instead of the second Garfield, seems kind of weird. Also, Microsoft Word recognizes Garfield as a word, but not Odie. Funfetti and custard together at last? I’m not sure how long Holiday Pies have been with us, but how can a pie shell that looks like Funfetti cake filled with custard turn you off? Holiday Pie is not to be confused with Festive Pie, which is Mincemeat and Custard. Also, TIL mincemeat is not actually meat. McDonald’s didn’t stop at pies, of course, their holiday menu extends to other desserts as well. Although, the Egg Nog Shake is just your standard vanilla shake with the added bonus of egg nog syrup. You’ll have to smuggle in your own bourbon. Can we get this kid a chair? McDonald’s capitalizes on holidays, there’s no denying that. Here’s a feel-good heart-warming commercial of Ronald showing off his sweet ice skating moves like he’s Brian Boitano, meanwhile some snot-nosed kid almost falls flat on his face. If only there were a Grimace for the top of my tree! 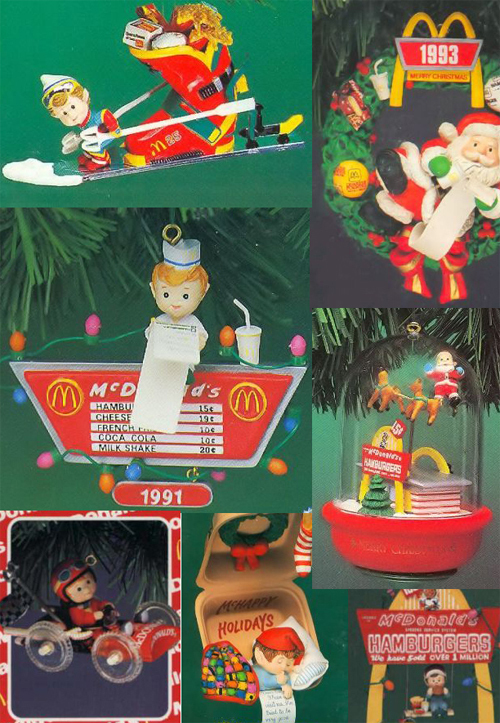 Enesco released a bunch of McDonald’s ornaments in the 1990s, because who wouldn’t want McDonald’s advertisements all over their Christmas tree? These include the 1977 and 1995 variety for when you need fine china. 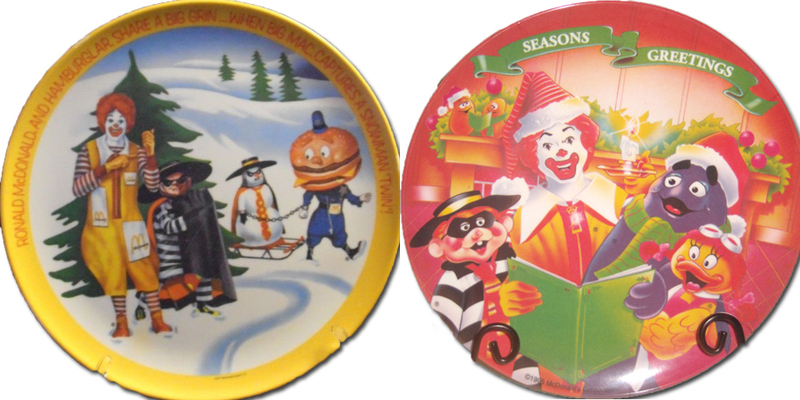 For reasons unknown, McDonald’s releases collectible melamine plates every so often. A few of these have been Christmas-themed and perhaps after you’ve eaten your Christmas mashed potatoes you’ve found Ronald’s smiling face looking up at you. Beats those Hercules plates everyone had. What are some of your favorite fast food holiday memories? Leave us a comment! This is a great post! The sad thing is McD’s does pretty much NONE of these things anymore. I remember when the holiday plate/glass/mug was a big deal. The movie tie-ins were fun as well. Excellent idea for an article!! I actually bust out our Kermit and Miss Piggie(still with tags!) every Christmas. Instead of continuing the cool, McDonald’s has being heading in the opposite direction, trying to make all of us slobs who eat there feel petty like we’re entering into some trendy modern European coffee shop. I suppose their point of ruining kids appetites for occasional fun and sloppy food and toys has been made. 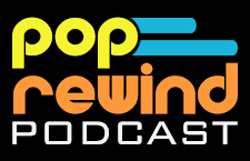 Maybe now they’ll only get sued for hot coffee spills. crookedninjathe collectible holiday glasses were always a hit in my household, and from a nostalgic standpoint, one of the things I miss most about fast food joints in the 80s/90s.